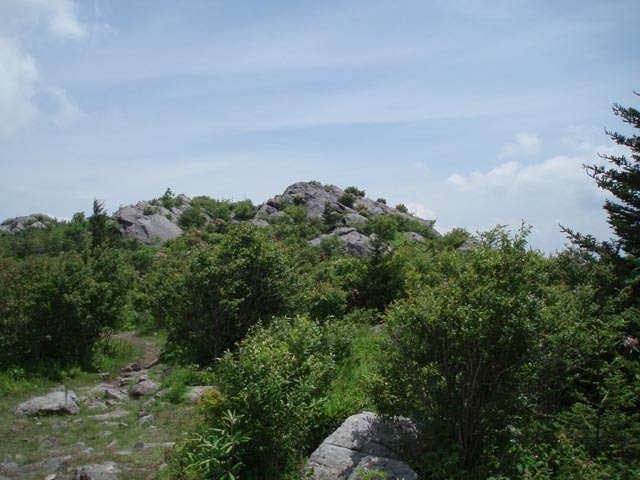 Description: This is the second in a series of hikes covering this popular area to be posted on this site. As with the Grayson Highlands State Park Circuit the exposed balds of the Highlands, volcanic looking rock formations to play on, the constant changes in landscape, fields and tunnels of Catawba Rhododendrons blooming in mid-June, clusters of Mountain Laurel and Flame Azaleas at the lower elevations in May and June, Rhododendron maximum (white Rhodos) in bloom along the streams in July, vista after amazing vista and the wild ponies make this area one of the premier hiking venues in all VA. 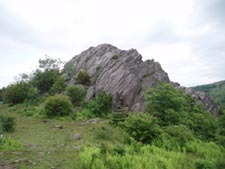 Unlike the State Park, even though it starts within it, most of this hike lies outside of the park and within the boundaries of the Mount Rogers N.R.A. There is a day use fee and a fee for overnight parking. Once you pass the gatehouse follow the park road. Turn right onto the Campground road and almost immediately turn left into the gravel AT Spur parking lot. Trail Notes: Besides the trails used in this hike the area contains a labyrinth of multi-purpose (i.e. 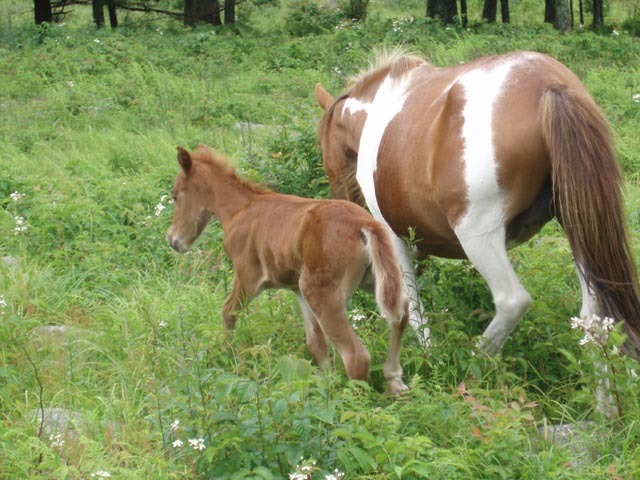 horse) trails. 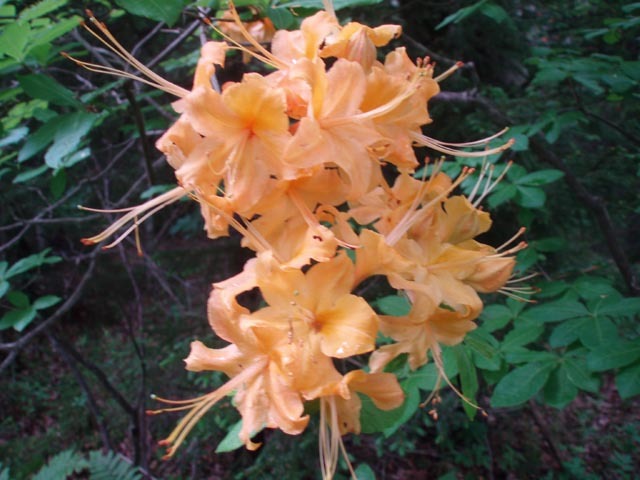 We've not shown them in their entirety on the map but note them as orange whenever your route crosses them. 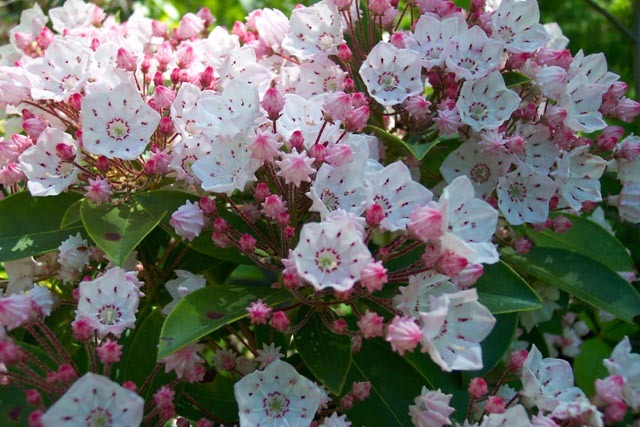 From the parking lot take the blue blazed AT Spur as you climb gradually through dark woods and small open meadows. In about 0.10 miles pass through a gate (Please close it to keep the ponies in.) and immediately cross a horse trail. 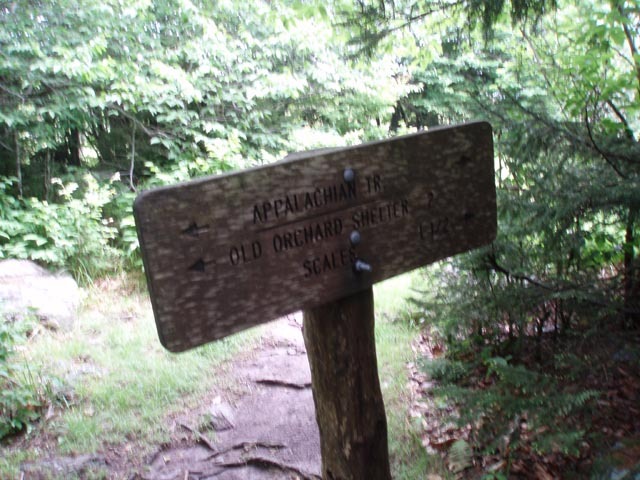 In 0.86 miles reach the AT. Turn left here and weave your way through giant rock outcrops and wonderful Catawba Rhodos. 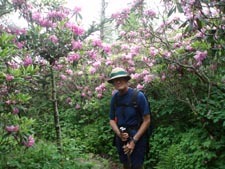 In 0.55 miles from the spur pass blue blazed Rhododendron trail on the left and cross a horse trail. Follow the AT as it gradually climbs to the highest points of Wilburn Ridge. Most of the next 1.11 miles passes through a virtual tunnel of Catawba Rhodos with breaks in the side from time to time providing expansive views of seas of the same with rock outcrops and balds dispersed irregularly among them. As you exit the tunnel you'll cross the Lewis Fork Trail. There is a very strong running spring flowing in two forks a short distance further along the trail. This might make a good camping spot but I didn't see a fire ring. (Please don't make a new one if there is not an existing one.) 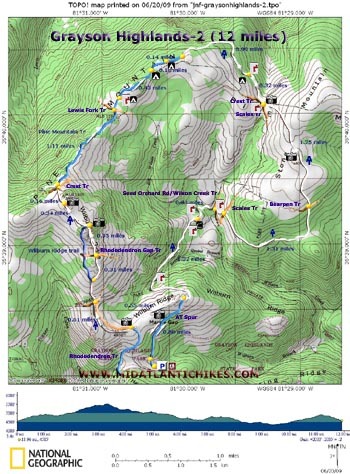 In 0.43 and 0.16 more miles pass two established campsites. We did not look for water sources here. You could haul water in from the spring you just passed. In 0.14 miles once again reach the AT. 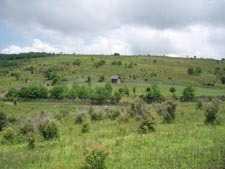 Apple Orchard Shelter and a spring are 2 miles to the left. To complete this circuit as described turn right onto the AT, heading for The Scales. In about 0.99 miles cross a stream. Shortly after this pass a very nice campsite to the left below the trail. It looks like it is not far from the bank of the stream just mentioned. In another 0.32 miles enter the area called The Scales. 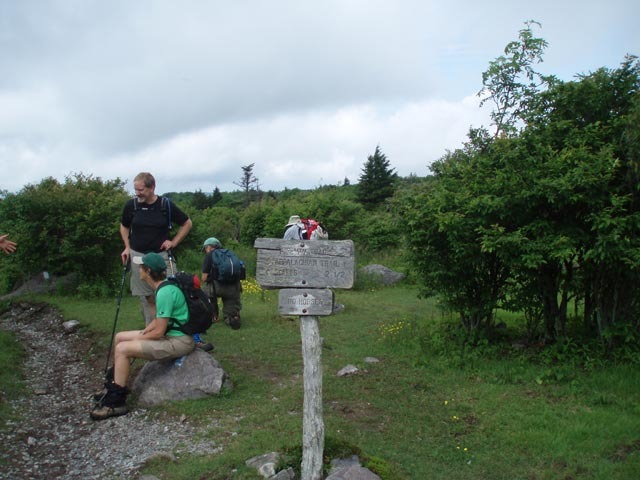 There is a piped spring at the junction of the AT and the Crest trail. Pass through the corral and gradually climb to the top of Stone Mountain. 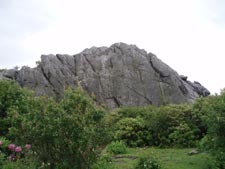 We do not know how it got its name because there is hardly a rock up there until you reach its southern end. As a matter of fact it is totally different from anything you passed on the trek. 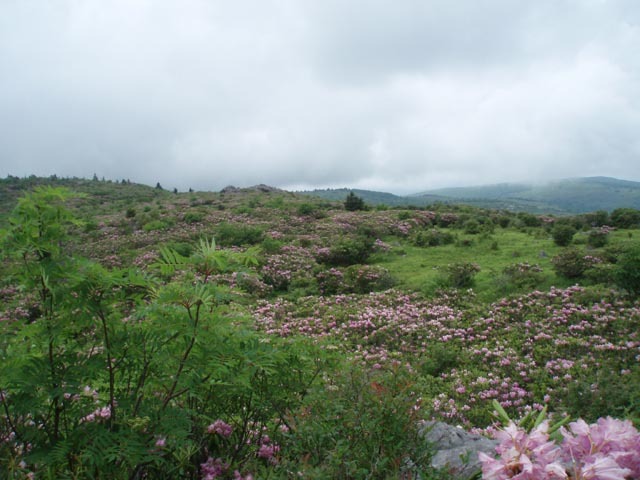 Instead of rocks, knobs and boulders you look out over a nearly flat plateau with fields of Hay-scented Fern and Whorled Loosestrife surrounded by mountains. 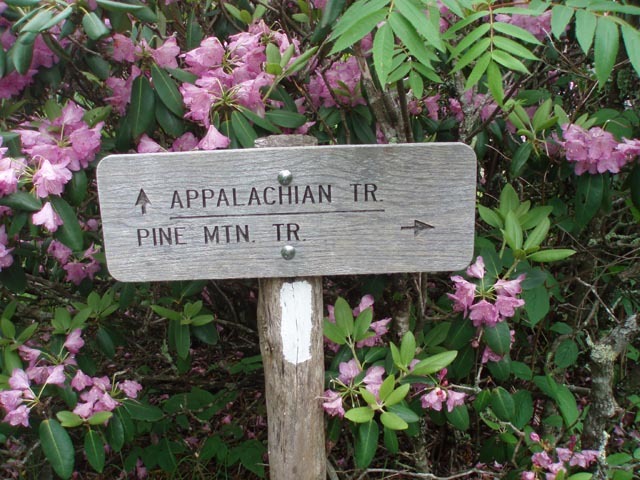 In 1.25 miles from the Scales cross the Bearpen Trail and enter the Little Wilson Creek Wilderness. In 1.31 miles cross the Scales Trail and then Wilson Creek on a bridge arriving at the Seed Orchard Road (no signage indicating it) and the Wilson Creek Trail. You'll leave the Wilderness in the process. Cross it staying on the AT. 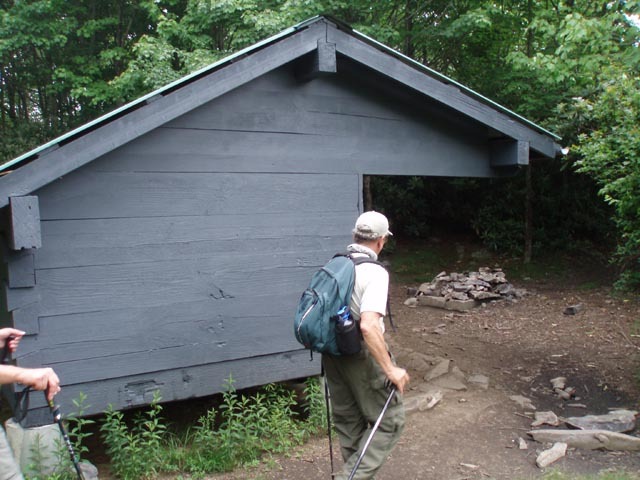 During the next 0.34 miles you'll cross another stream on a bridge and then a fence using a ladder before reaching the Wise Shelter. (I can't remember the order they occur!) 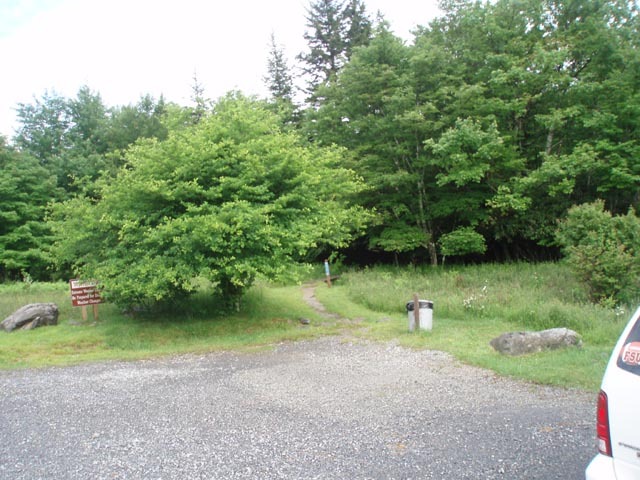 While tenting is not allowed in the immediate vicinity of the shelter there is a nice field just before it and some individual spots on unofficial trails in front of it. A privy and spring is close by. 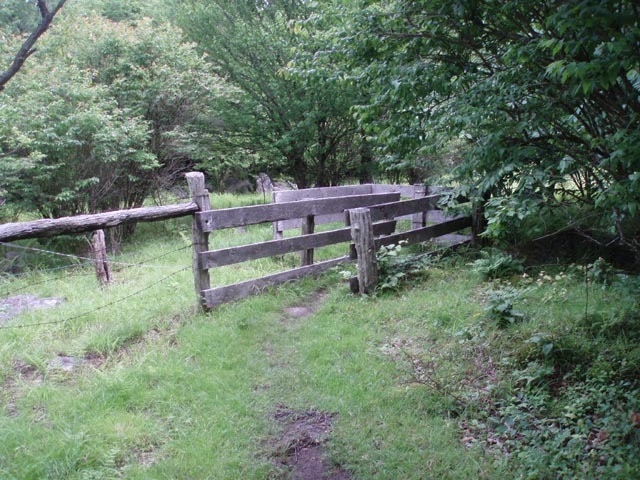 Over the next 1.32 miles you'll pass through two styles in the fence that separates the park from the N.R.A. 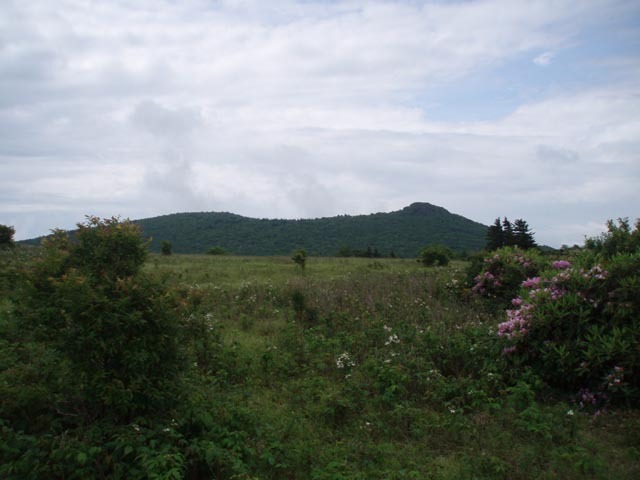 and climb back up to the lower Wilburn Ridge and the AT Spur. Turn left here and retrace your initial 0.86 miles back to your vehicle. Critique: Your descriptions of this hike were a great intro to this beautiful area. 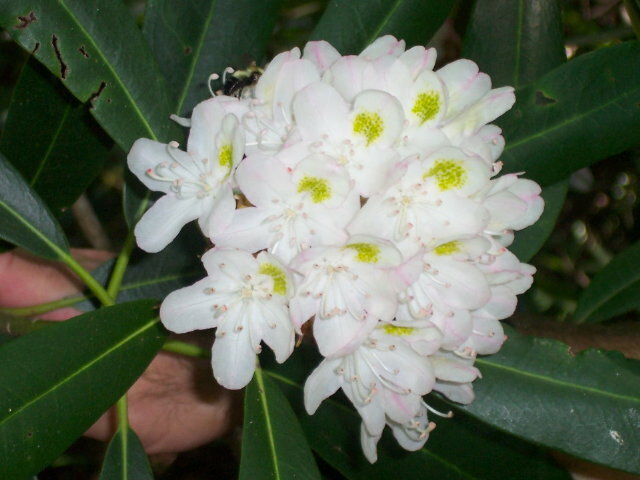 My son and I were feeling sorry that we couldn't see the June rhododendrons in bloom, but were thrilled to see the white variety blooming along Lewis Fork and Big and Little Wilson Creeks in late July. 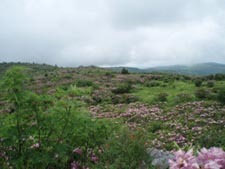 Even better than the flowers were the high bush blueberries that we began eating on the AT Spur Trail and never stopped enjoying the entire hike. Also, the variety of mushrooms along the Cliffside and Lewis Fork Trails, and then along the AT between Old Orchard and Wise Shelters was phenomenal. Every color and shape, and many we had never seen before. 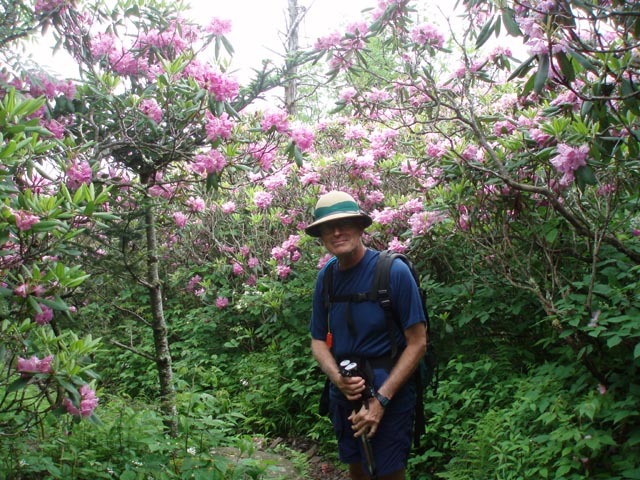 We made this a 3-night, 4 day trek by adding in Mt.Rogers and the Cabin Creek waterfall loop. Thanks for your great website. Critique: I did this the Friday after Memorial Day. I was planning on making it a 2-3 day excursion earlier in the week, but all it did was rain and I really didn't want to deal with it. So Friday's forecast was non-rainy, so I did this simply as a dayhike. I did the route described, except I also hiked out to the top of Mt. Rogers, and I did this counter-clockwise. So it was 15-16 miles. Thankfully the elevation change was never anything crazy - I never needed to stop for a break, just for the many many photo ops. I'd say the most "boring" area was Little Wilson Creek Wilderness - just a walk in the woods. Don't shortcut it though, because north of it is Stone Mountain and the best landscape/views of the hike. 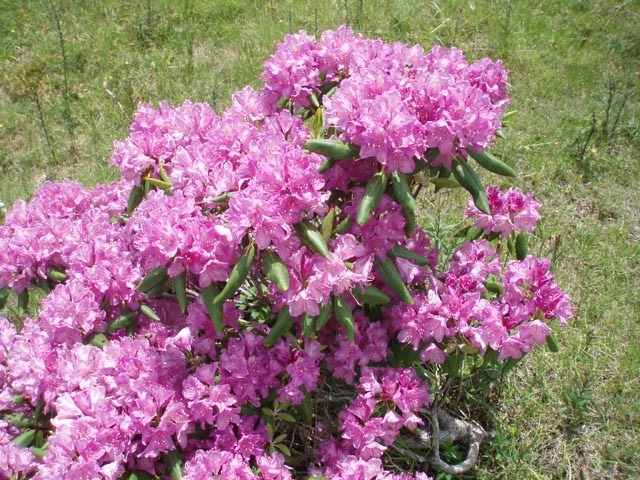 Sadly the rhododendrons were still prepping when I was there, as I didn't see any blooms. 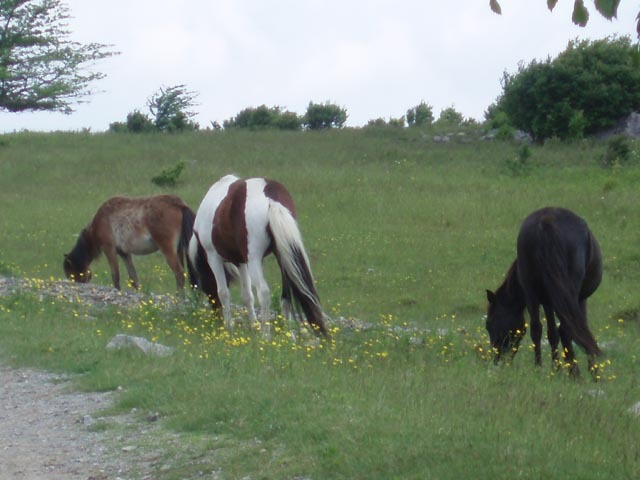 The ponies didn't disappoint though! 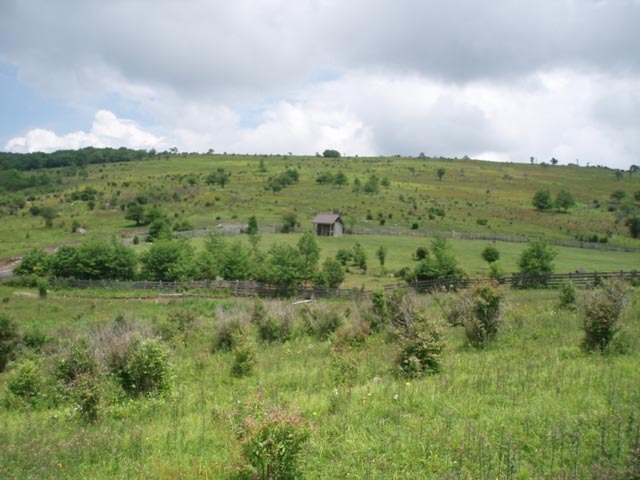 On this day, they were pretty much all around the Wilburn Ridge and Thomas Knob shelter areas. 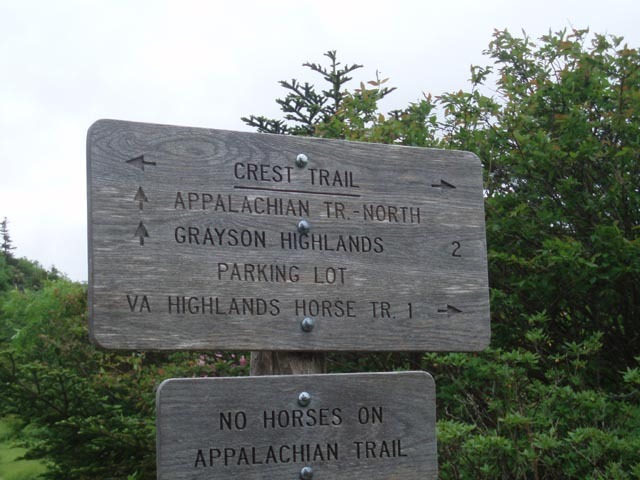 I'm not sure how many hikes feature the sounds of a hiker begging a pony to stop chewing on his tent.